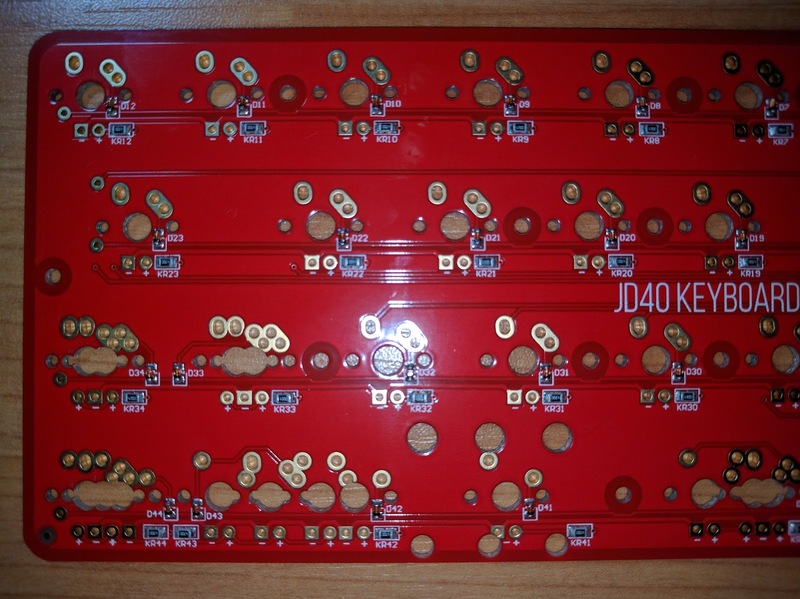 The first 3 are built on the MiniVan PCB, I bought one spare, and won one in a contest. 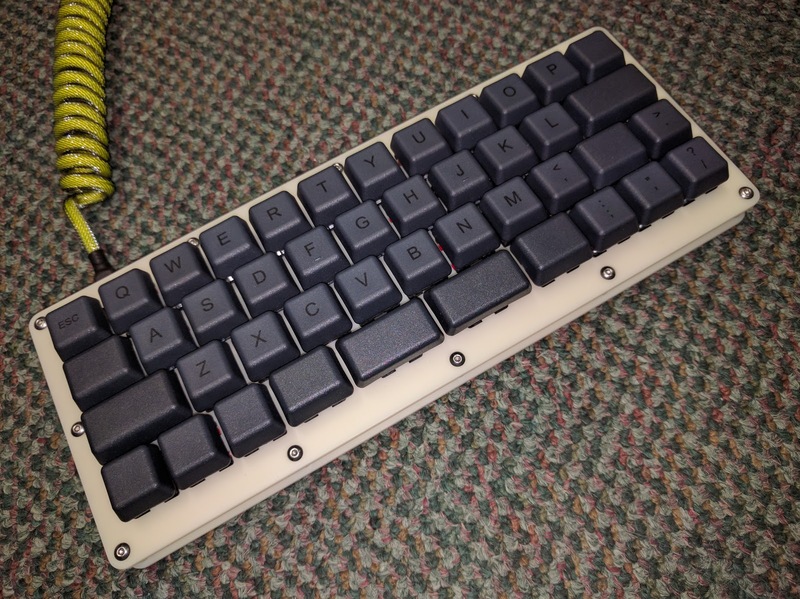 The Teensy LC/3.0/3.2 were made from left over reject plates from Ponoko. 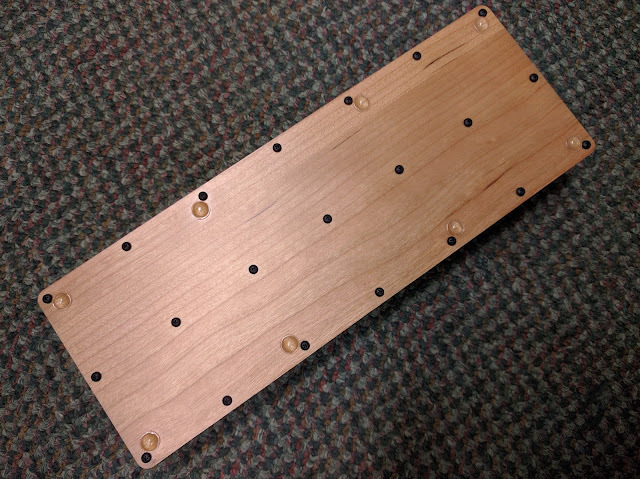 They cut one from the wrong material and one they cut poorly. 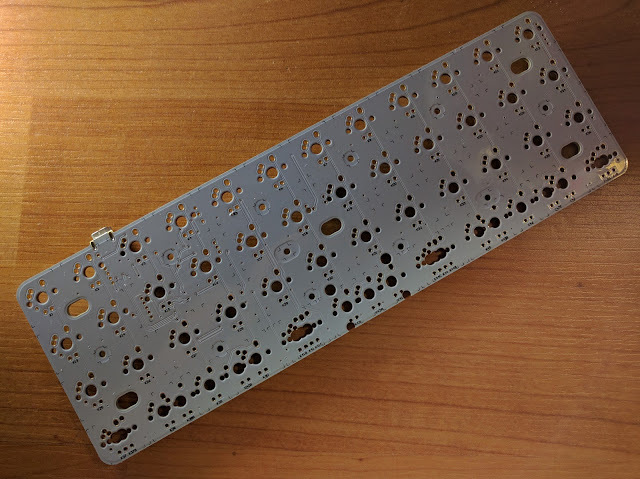 The hardcase is from Monoprice. 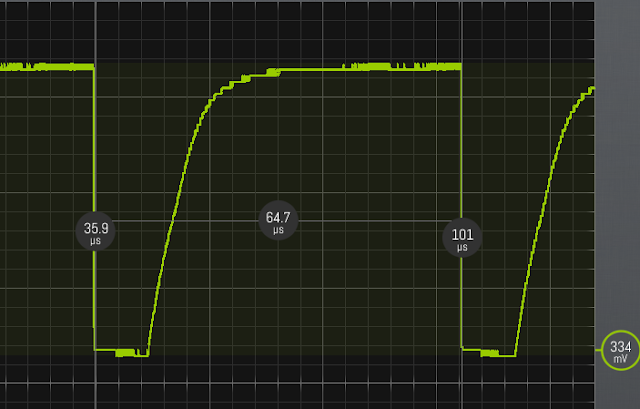 65us per matrix scan. ~15000 scans per second. 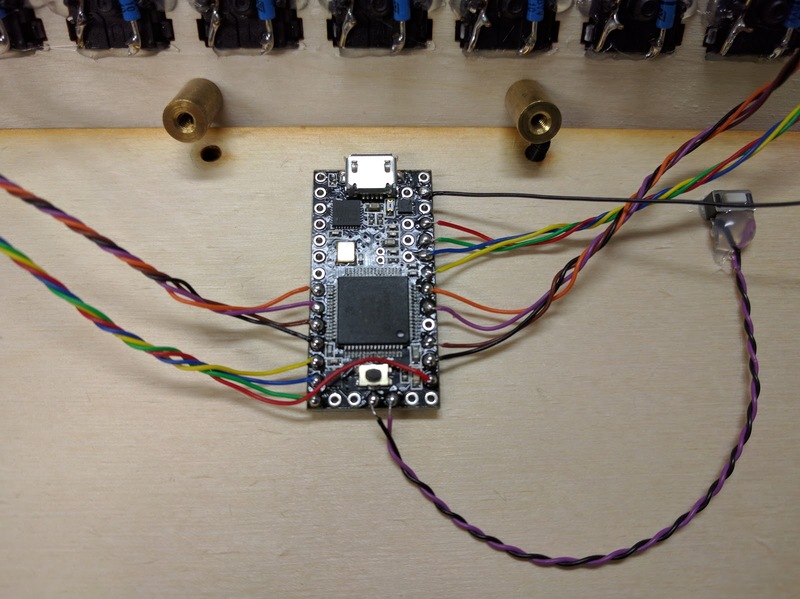 Faster than the Teensy 3.0 and Teensy LC running the same TMK code. 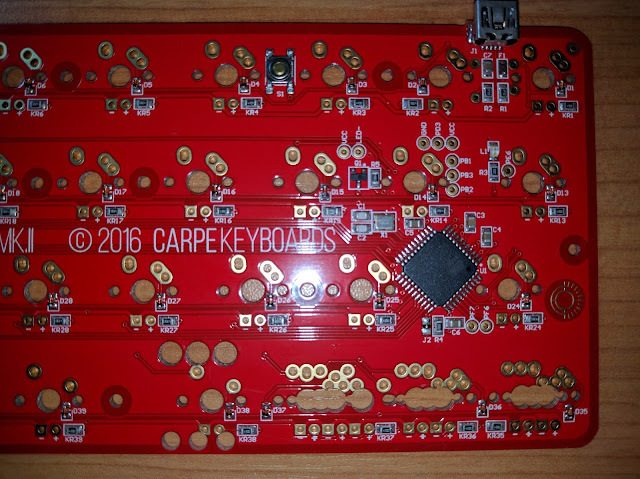 This is a hand wired keyboard running TMK on a Teensy 3.0 board. 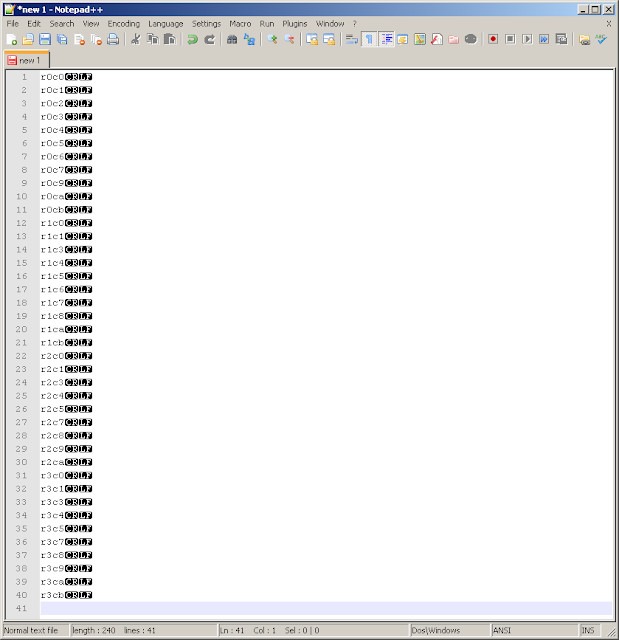 A single matrix scan is about 76 microseconds. Which is about 13000 scans per second. 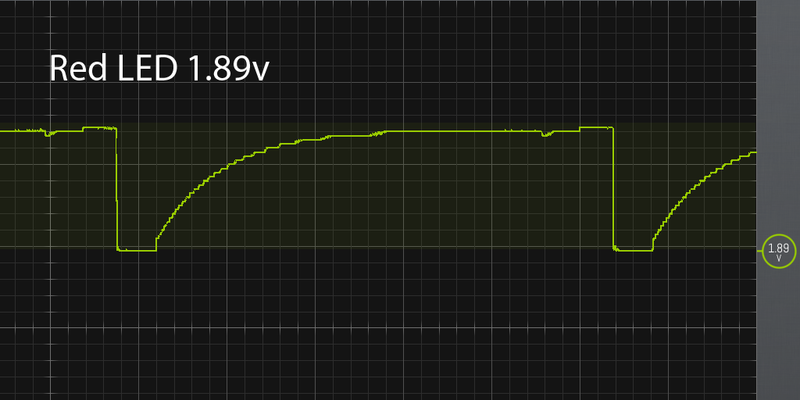 This is faster than the Teensy LC running the same code. The Teensy 3.2 is even faster. 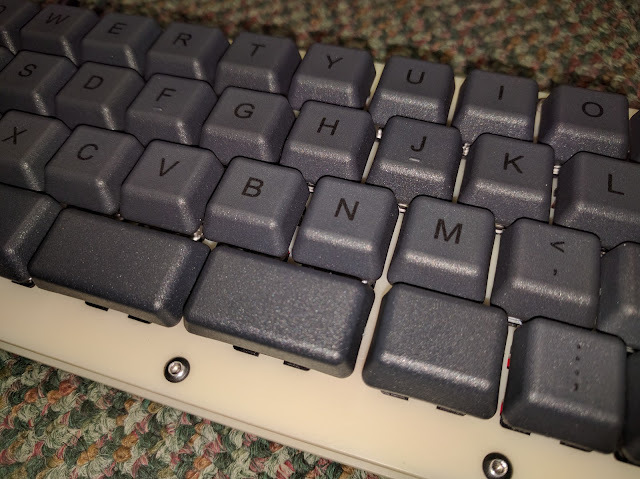 This is my second JD40 using the original layout with 6.25 spacebar. 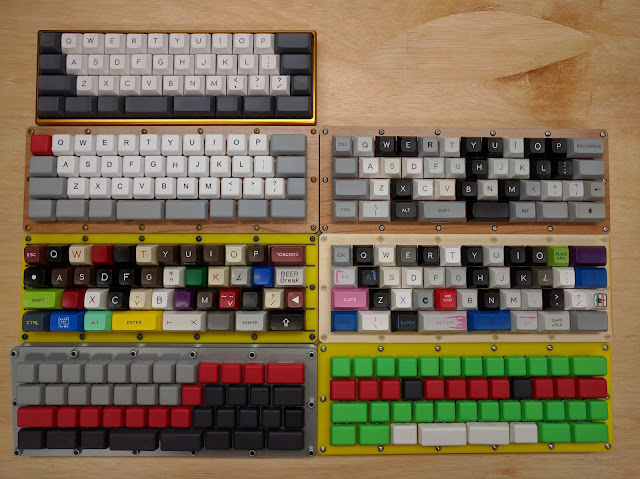 The first JD40 had a different bottom row. 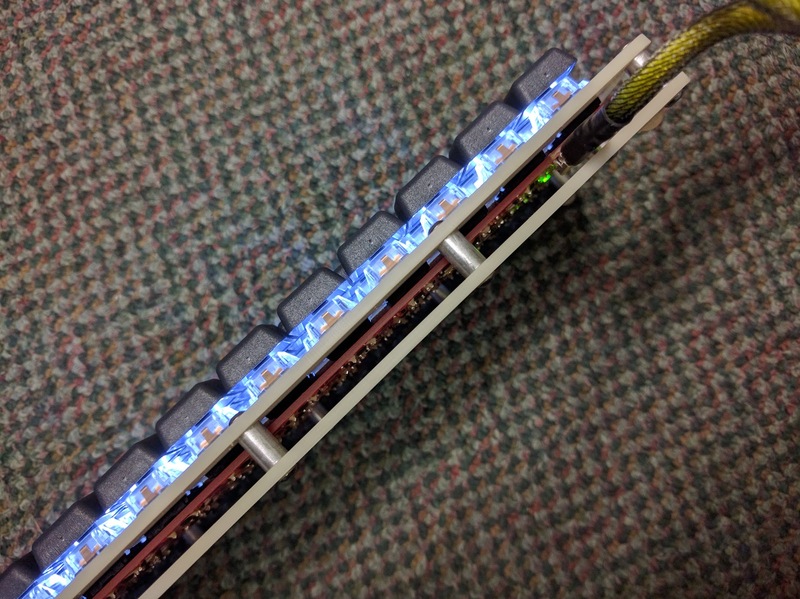 This is a hand wired keyboard running TMK on a Teensy LC board. 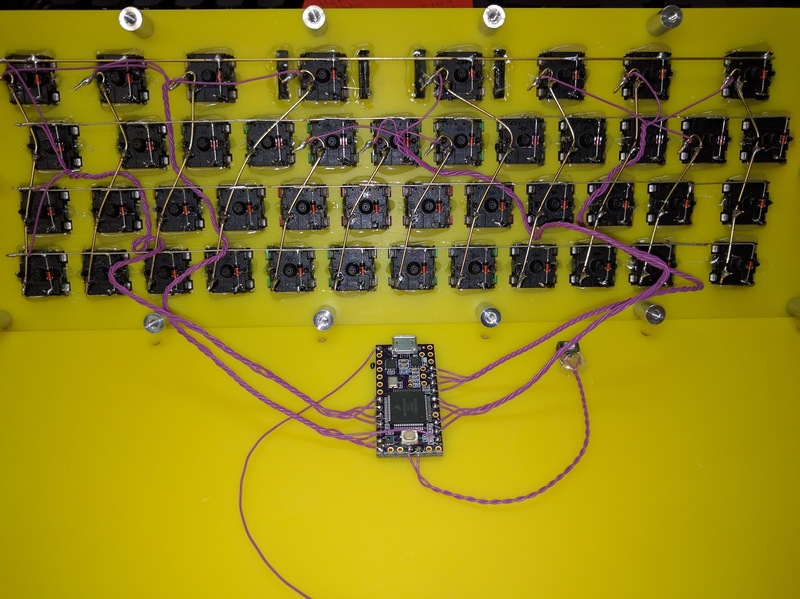 There is a bug in the compiler or libraries that causes the 30 microsecond delay after setting the row to be executed as a 1 millisecond delay instead. 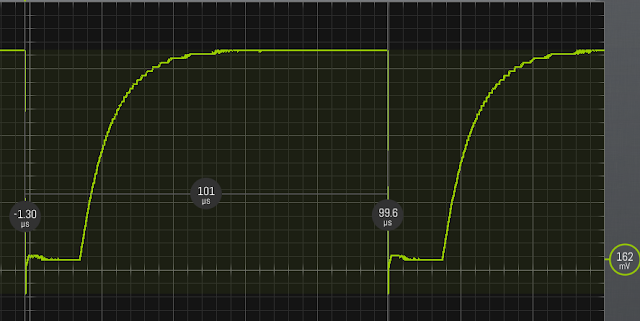 This was causing a single matrix scan to take 4 milliseconds. 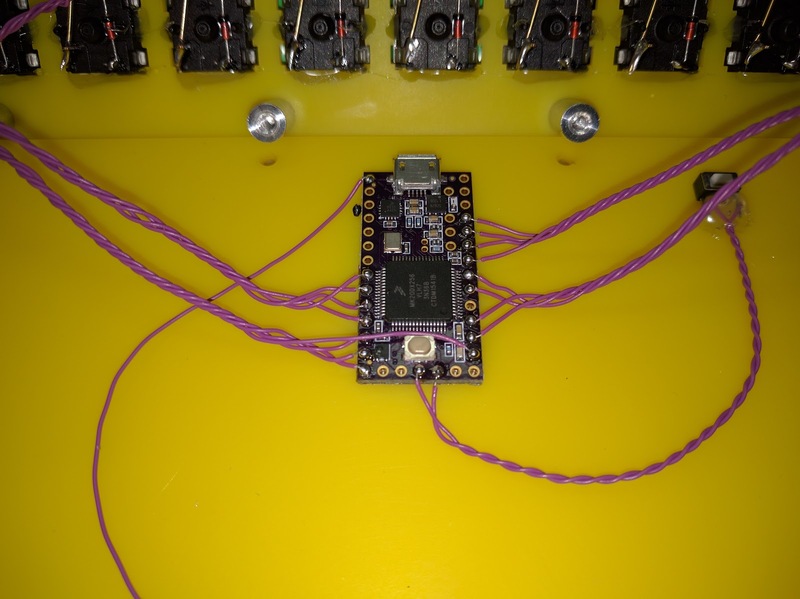 Replaced the delay with a small loop that toggles the status LED connected to pin 13. 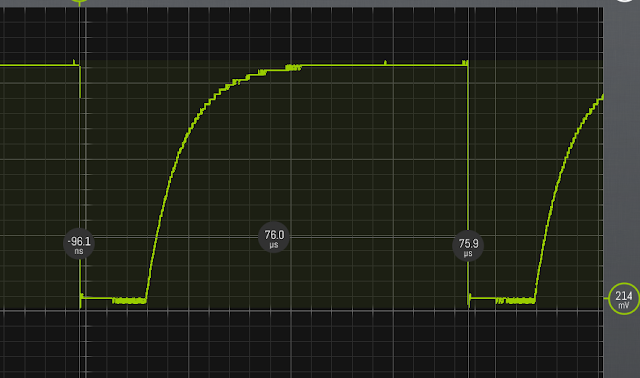 Reduced the number of loops so that a single matrix scan is about 101 microseconds. Which is about 9900 scans per second, about twice as fast as TMK on an AtMega32U4. Graphs of matrix scanning times of other firmware here. 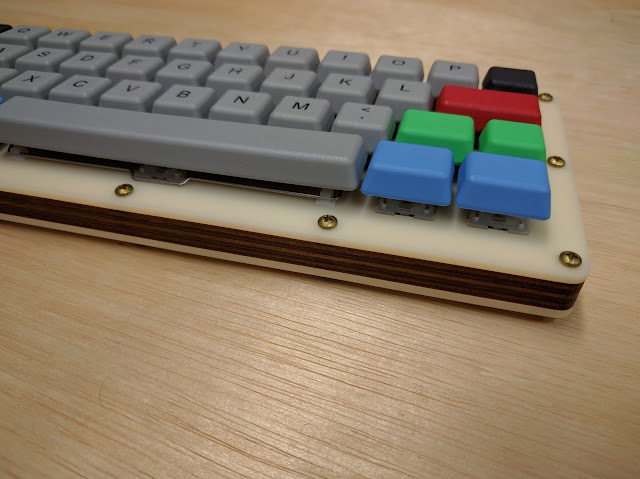 The Teensy 3.0 is even faster. 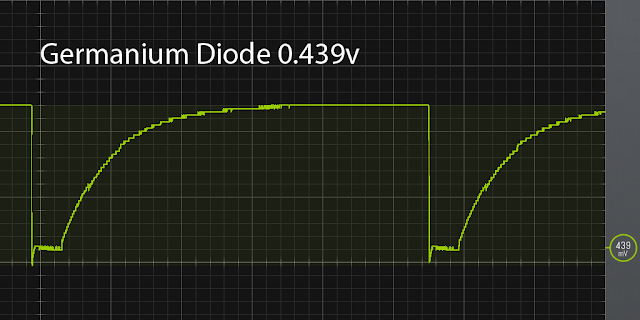 According to the AtMega32U4 datasheet, at a Vcc of 5volts, for a pin to read as low it must be below 0.9volts. To read as high it must be over 1.9volts. When a switch is pressed that column (data pin) is pulled to ground through the diode and should read as low. 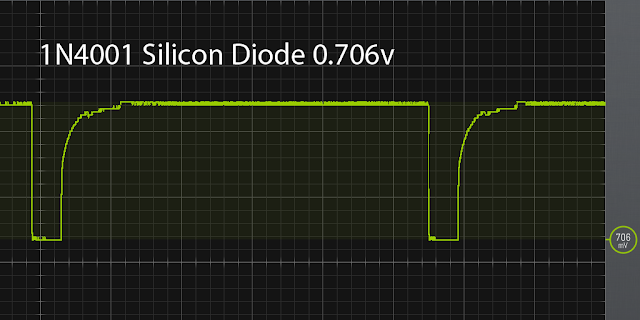 When no switch is pressed that column remains in a high state, pulled to Vcc through a built in resistor. 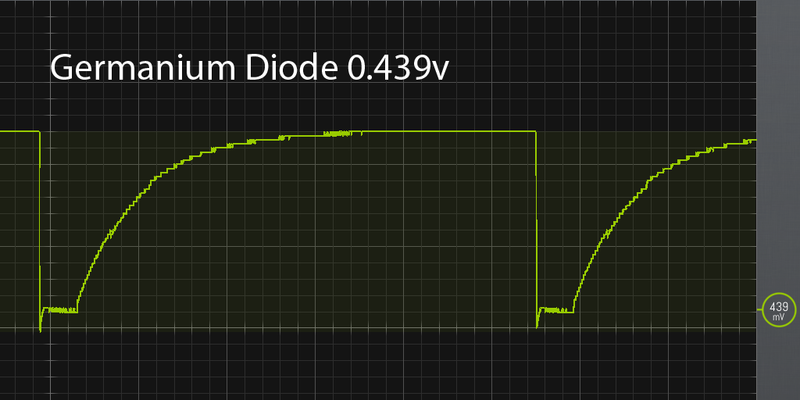 The 4 rectifying diodes all pull the voltage down to below 0.9volts. 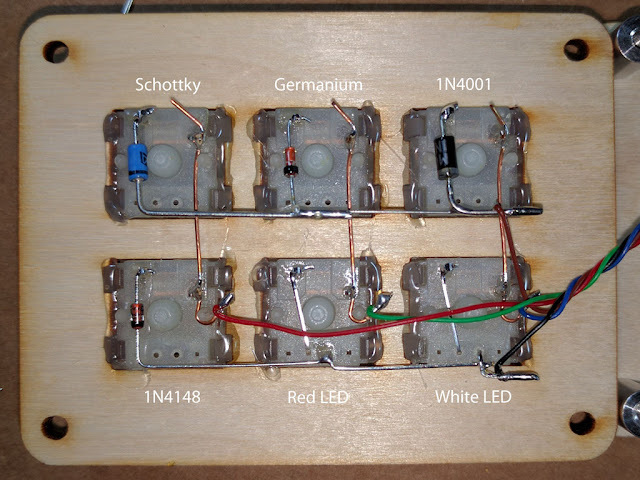 The two LEDs do not. 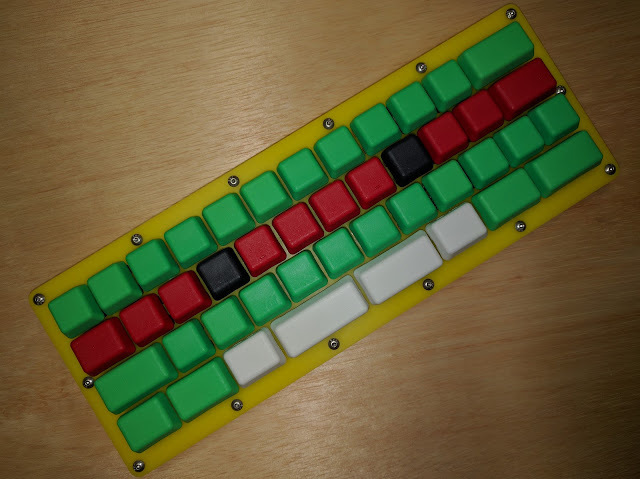 Testing was done using a 6 key macropad wired in a 2x3 matrix. 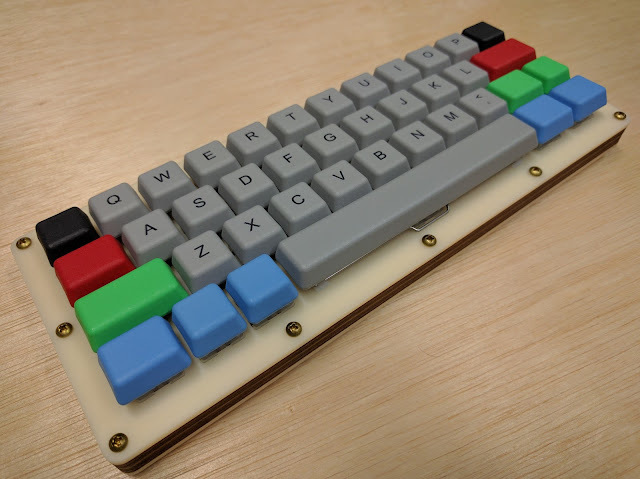 This was connected to an Arduino Pro Micro running QMK firmware. 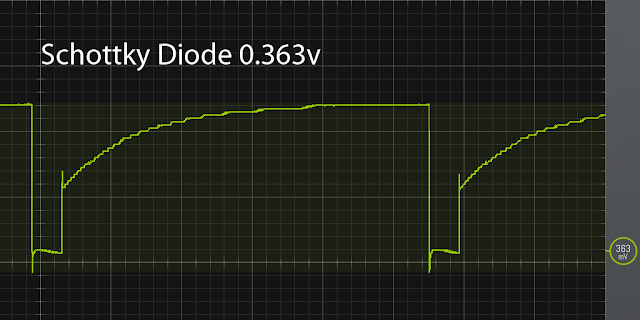 These graphs show the voltage drop when pressing the key of a particular diode. 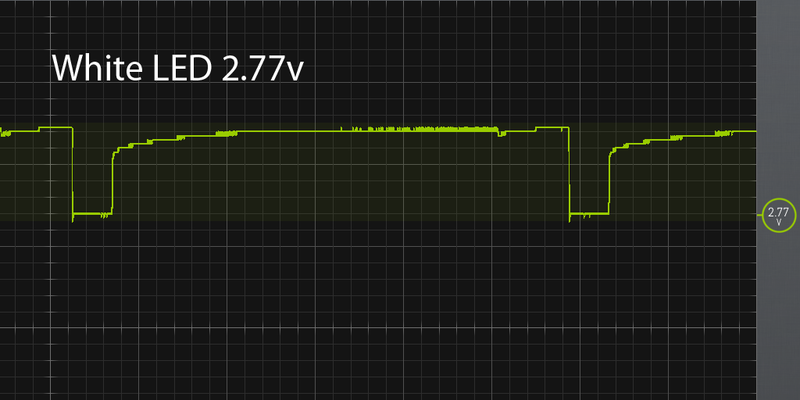 The major divisions are 2 volts. 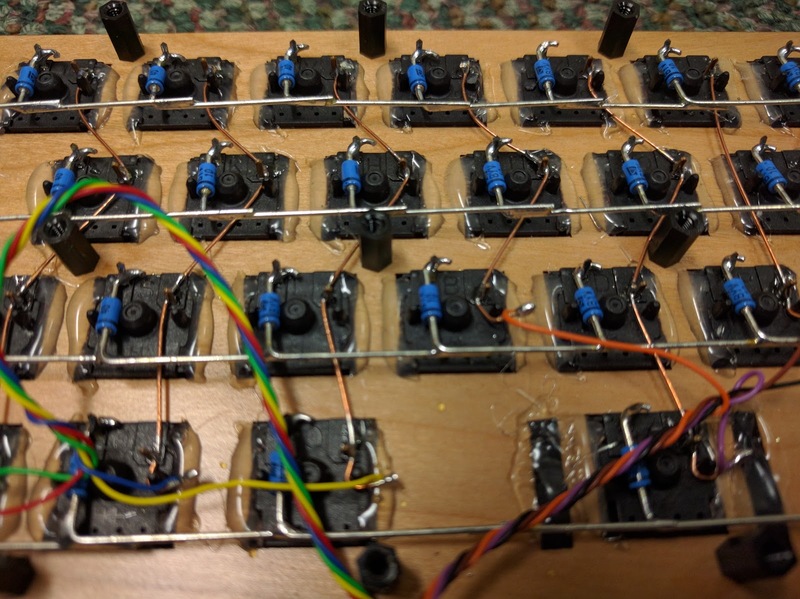 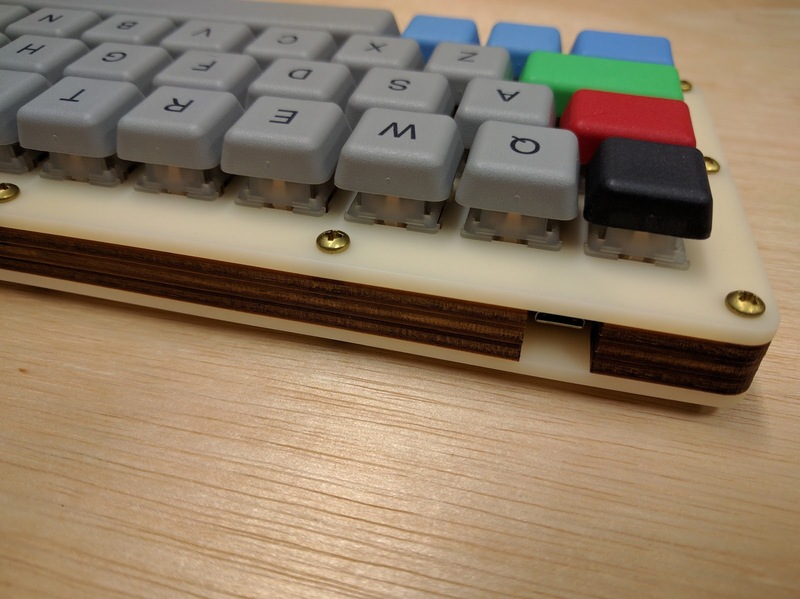 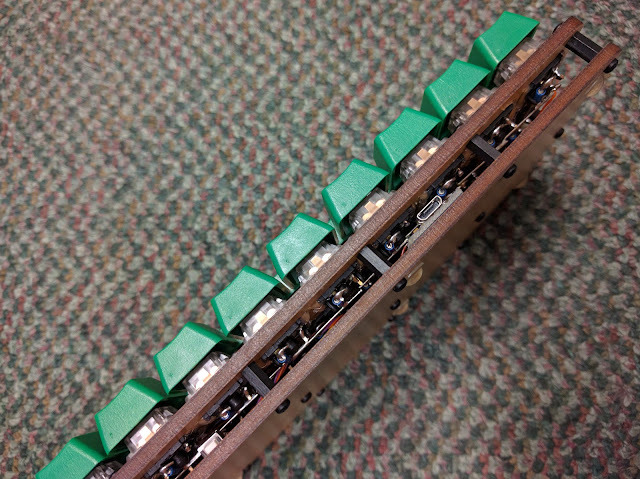 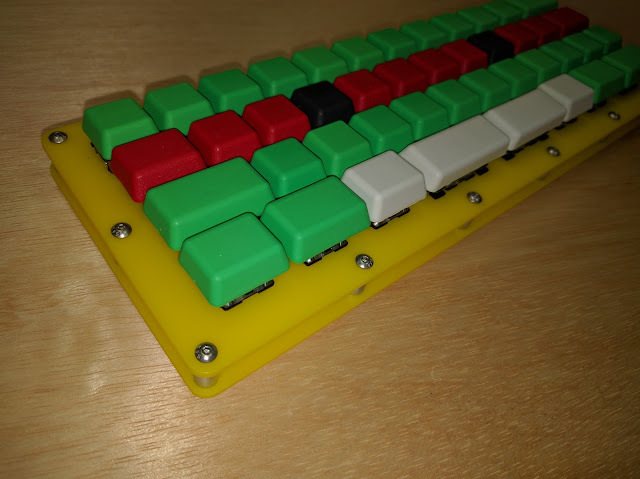 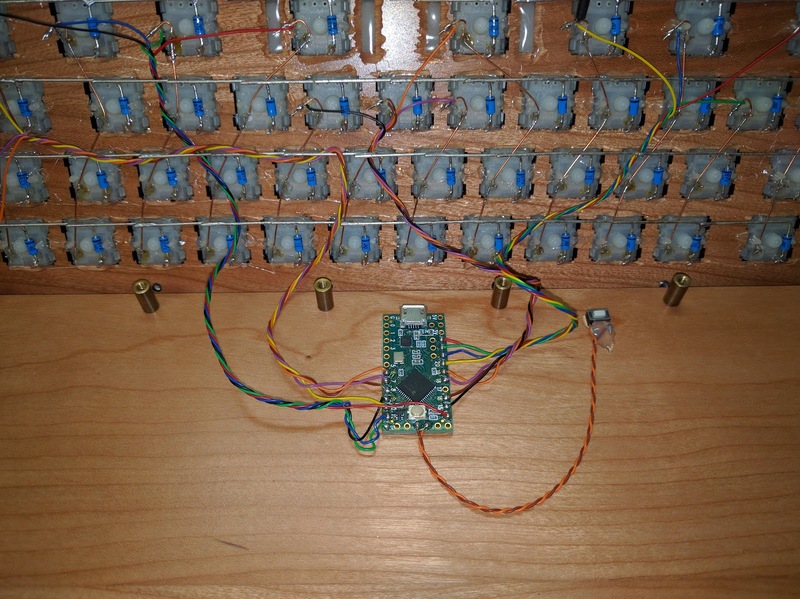 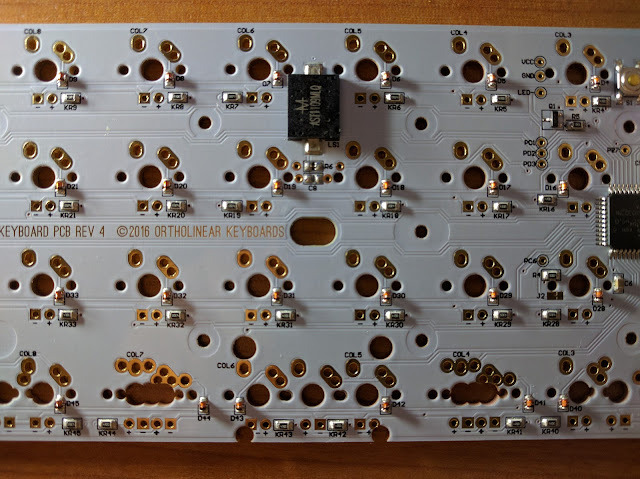 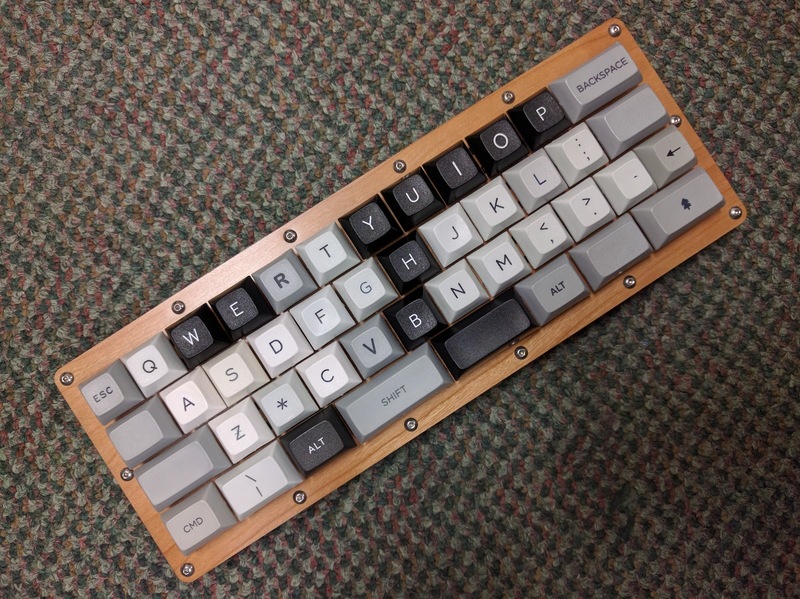 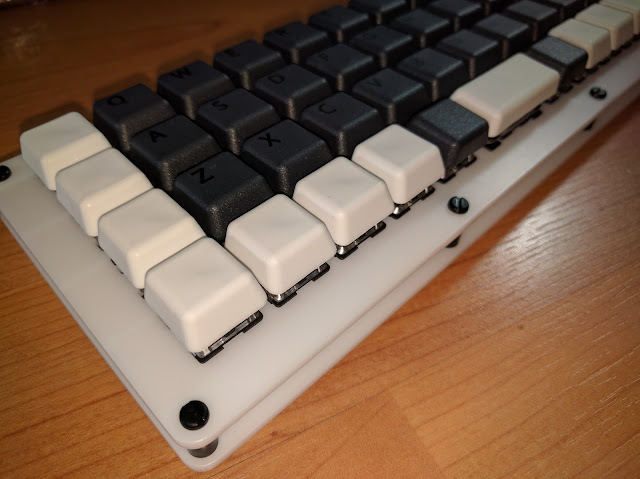 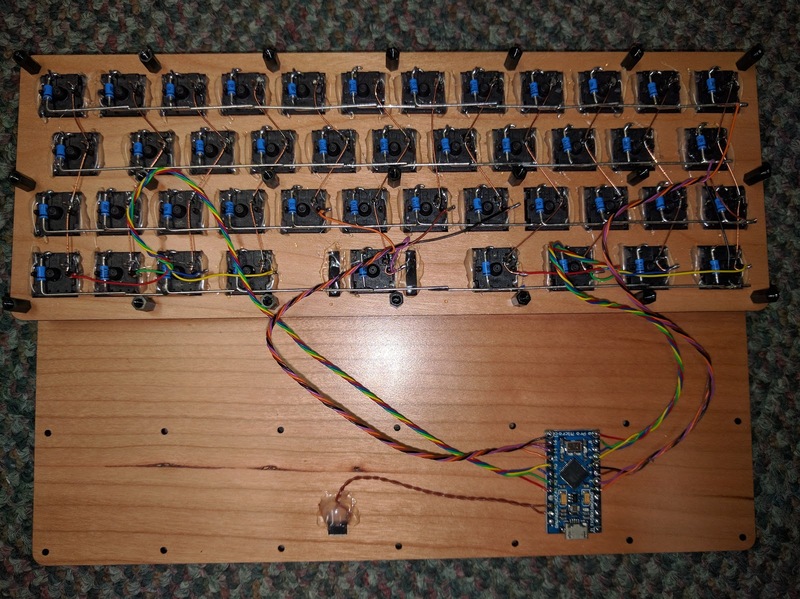 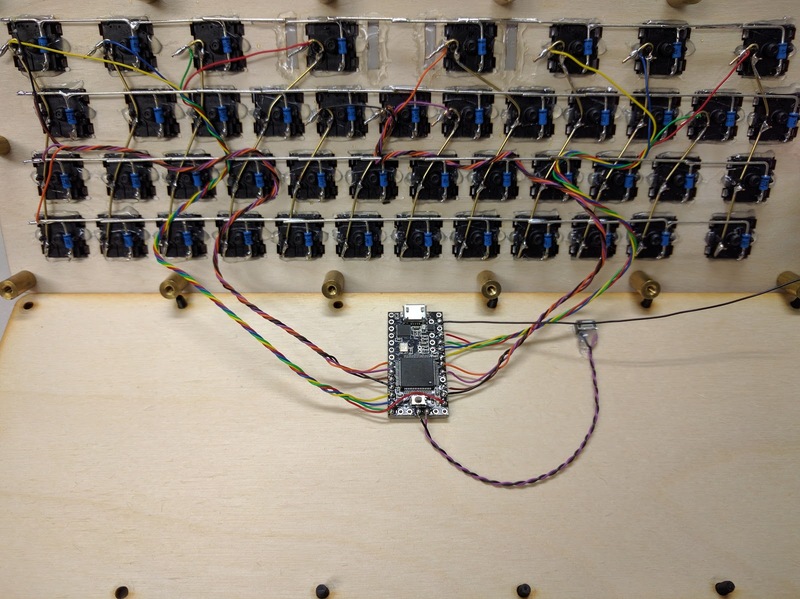 Quark keyboard with BYV10-40 Schottky diodes. 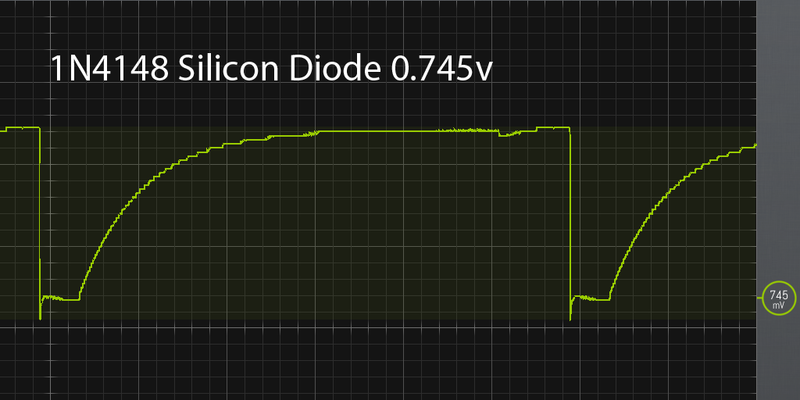 Higher performance than typical 1n4148 silicon diodes. Lower forward voltage, faster recovery, and they are blue. 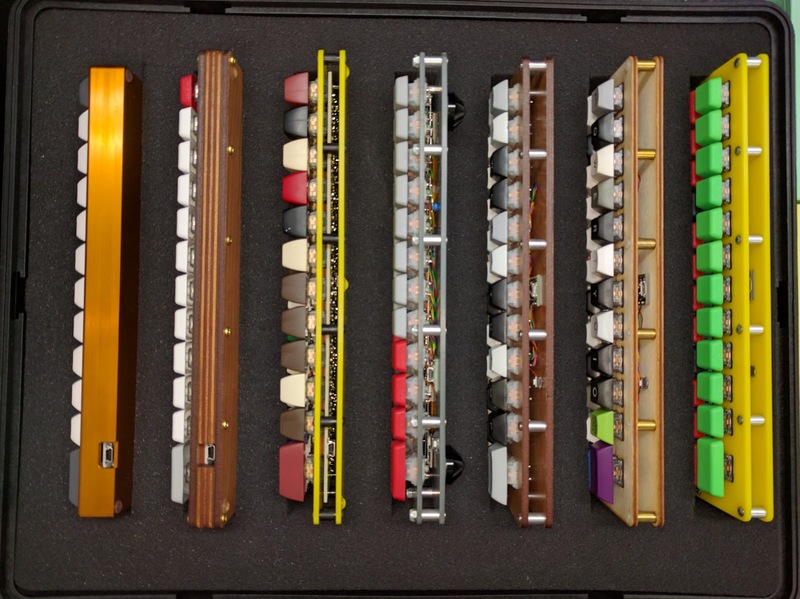 In practical terms you will not be able to tell the difference. 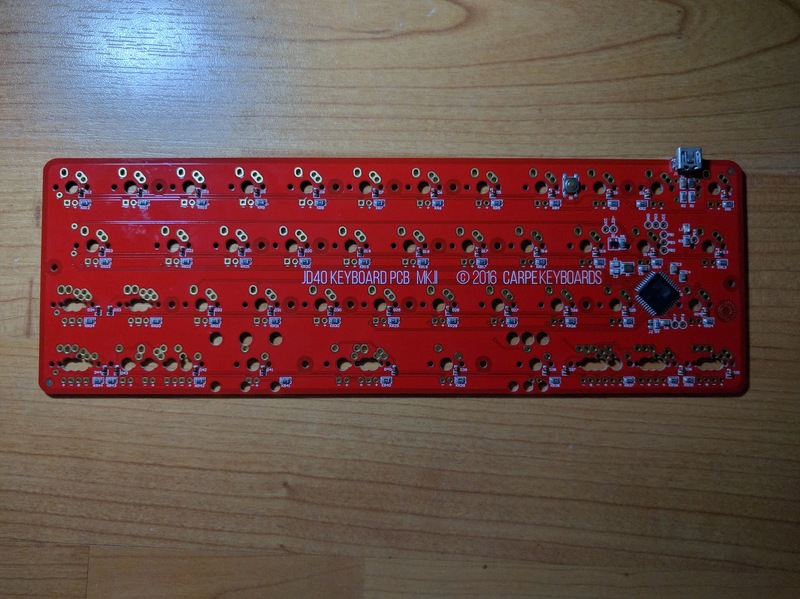 The pin the LED backlight is connected to does not have PWM output capabilities. 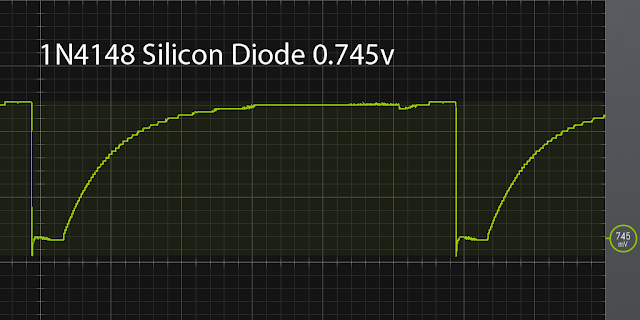 Anything that changes the response time of the scanning matrix will cause the LEDs to flicker slightly. Latest version of PCB. 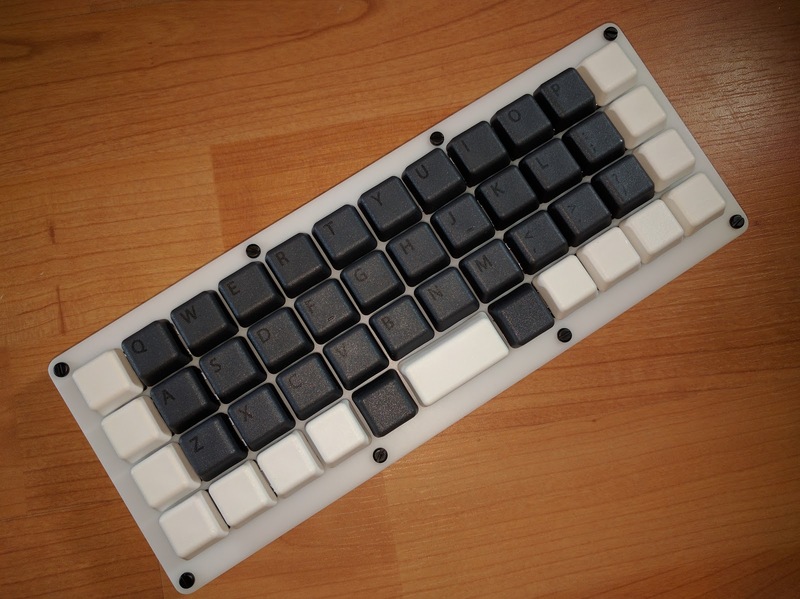 Now White, previous versions were Black. 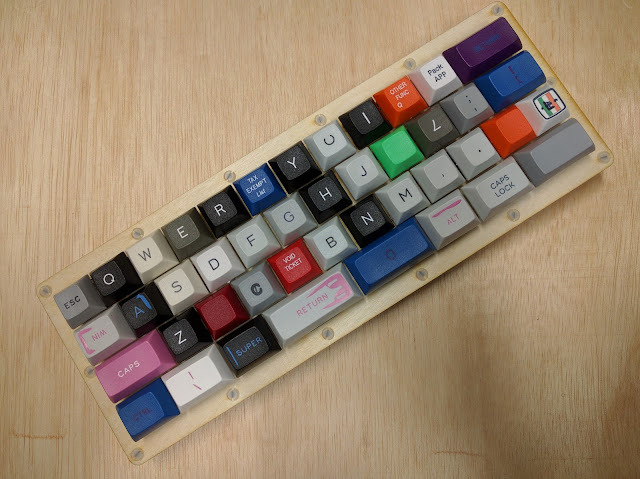 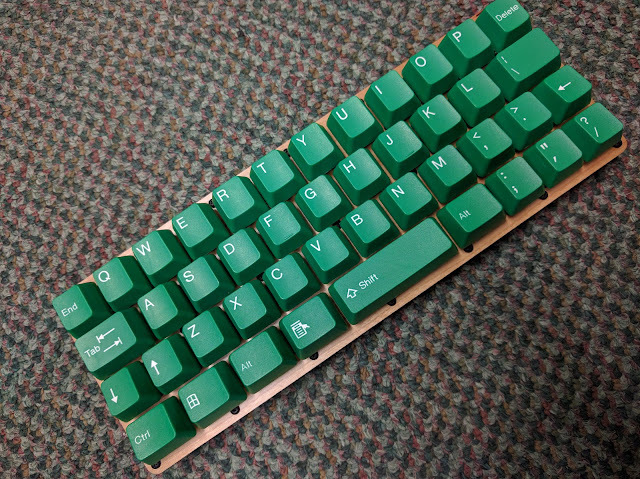 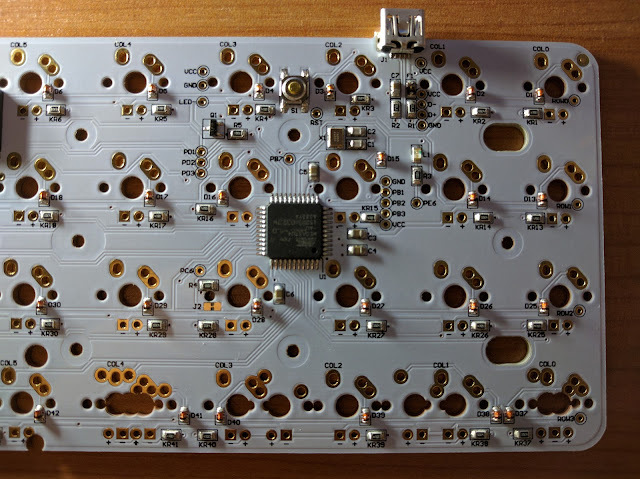 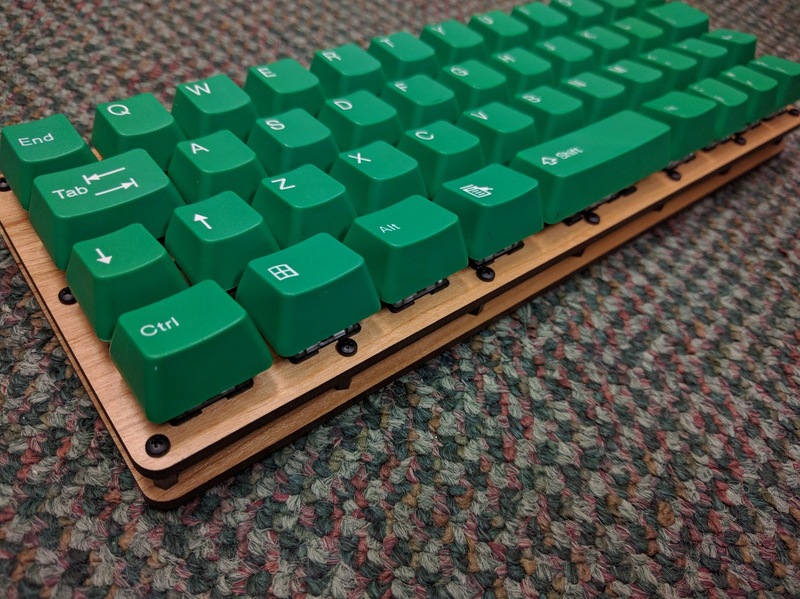 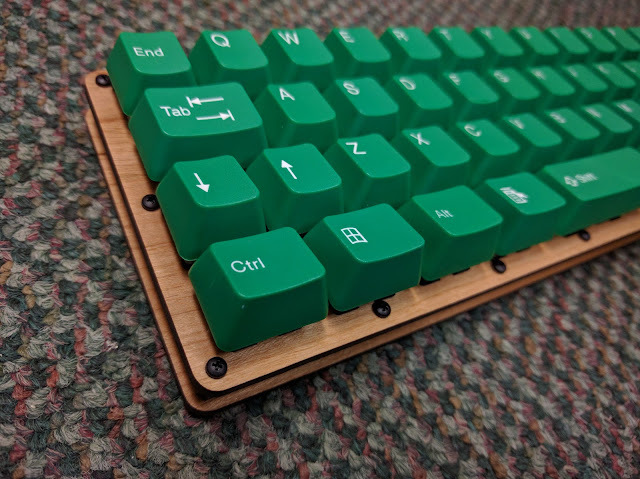 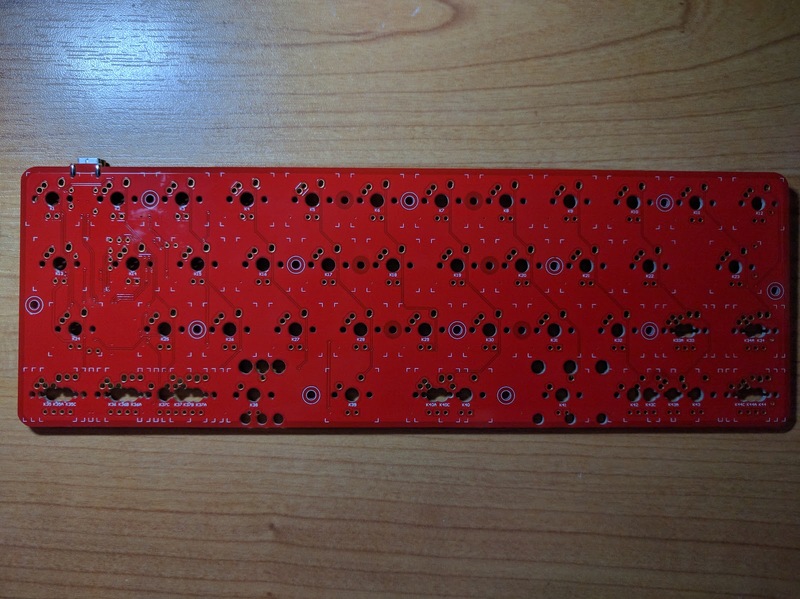 The new JD40 MK.II PCB has very similar components and design. 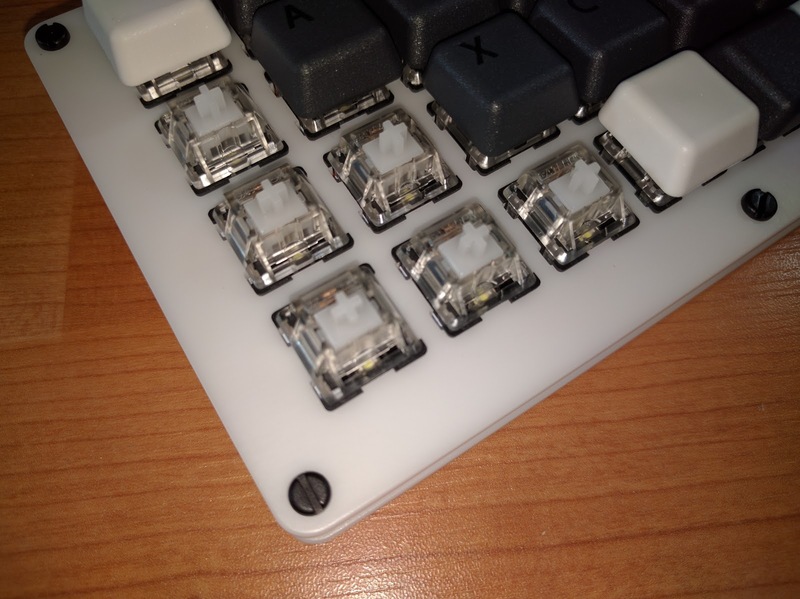 White 2x3x4 LEDs installed inside the switches. 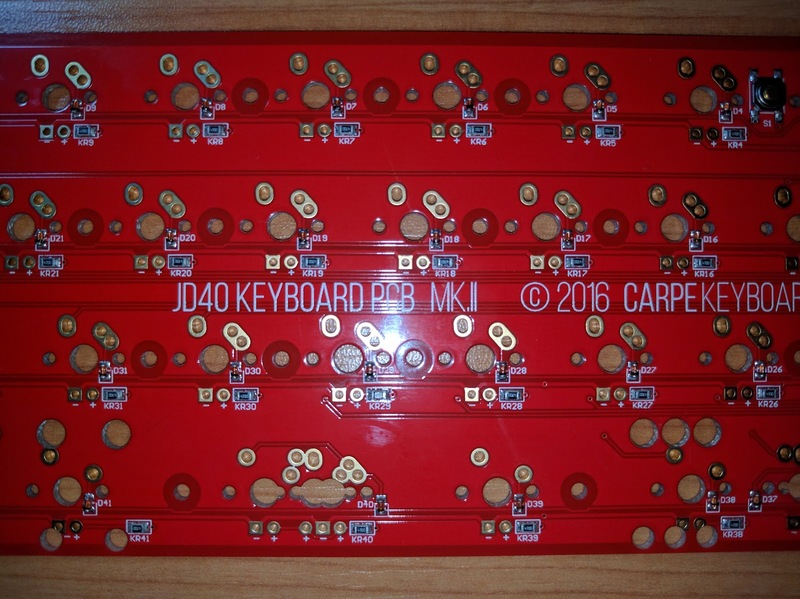 Cherry PCB stabilizer mount holes for spacebar. 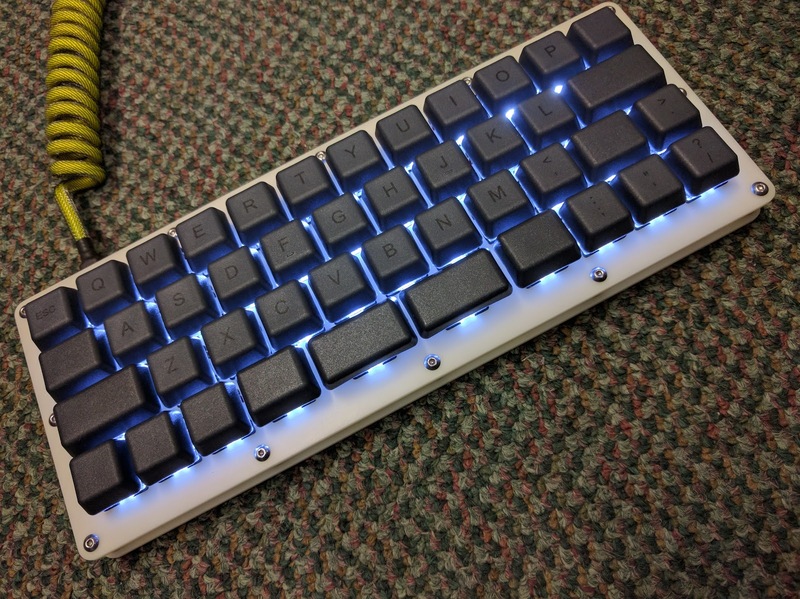 Purchased directly from TechKeys for $35 with free shipping to the US. 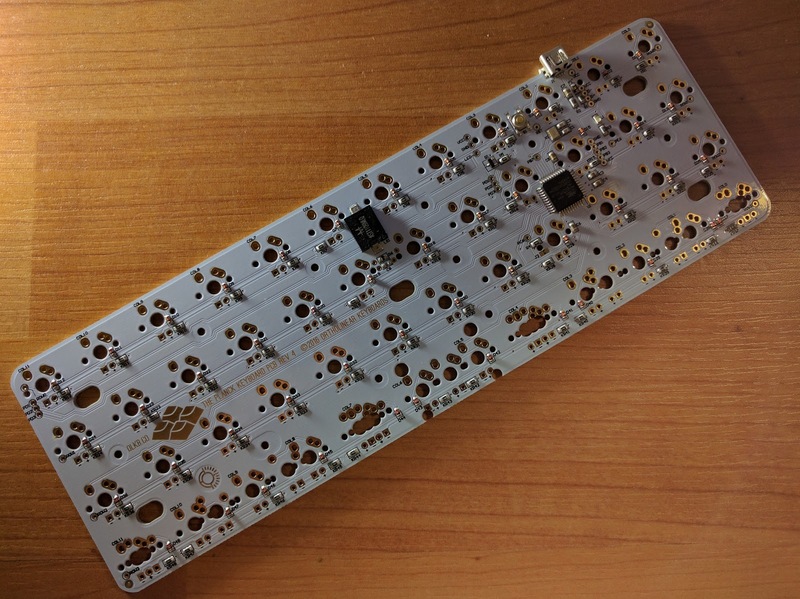 The design and components are very similar to the Planck PCB. 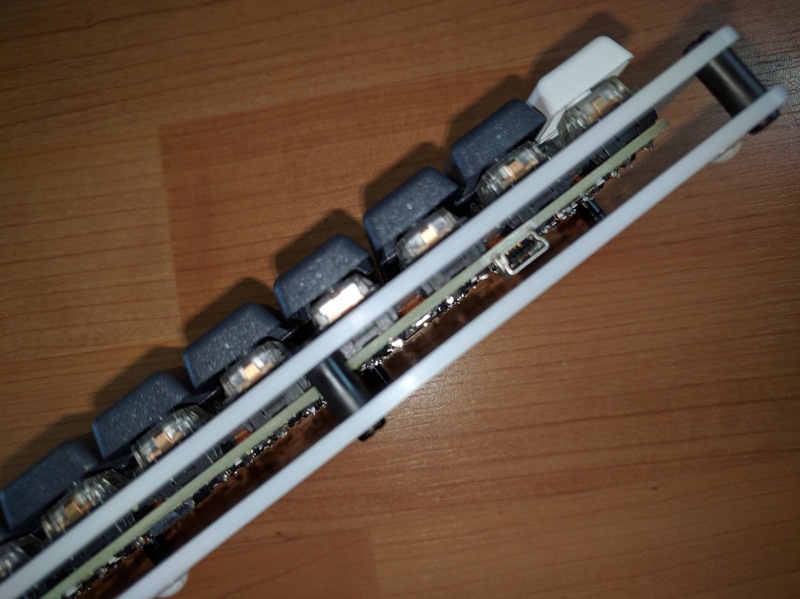 Uses the same pins for back light and status LED. 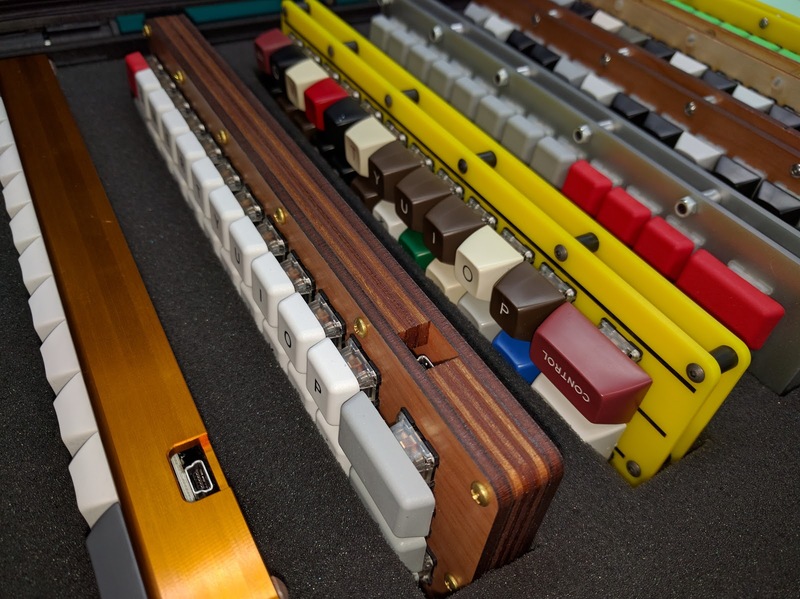 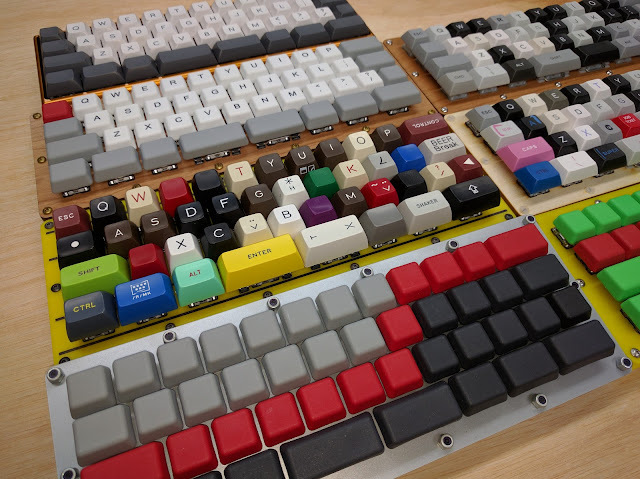 Bottom row supports multiple layouts besides the original JD40 layout. 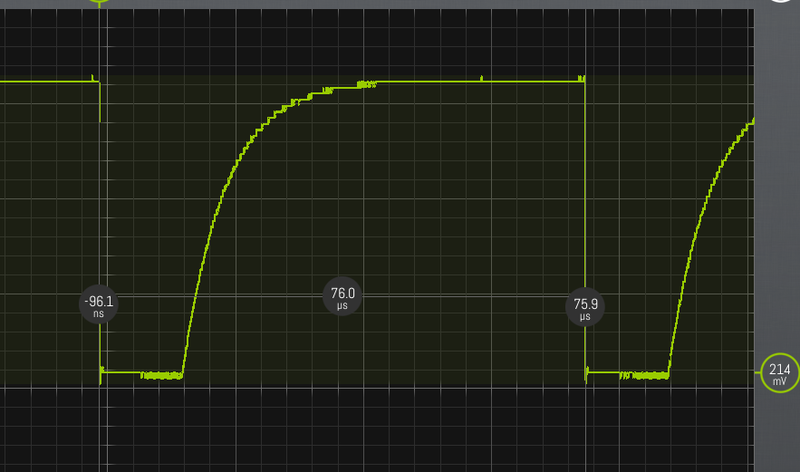 Right shift can be swapped with FN. Unused pins are broken out to pads.